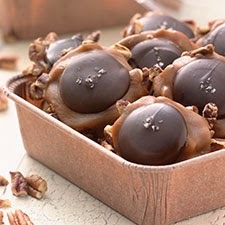 This quick, easy candy combines toasted pecans, caramel, chocolate, and coarse sea salt, for a gourmet touch..
Divide the pecans into 16 small piles on a parchment-lined or lightly greased baking sheet (a scant 2 teaspoons pecans each). Flatten each caramel cube into the size of a half dollar, and place on the pecans. Heat in the oven for 2 to 3 minutes, until the caramel softens and begins to melt. Remove from the oven; wait 1 minute, then top each cluster with one disk of chocolate, pressing it into the softened caramel gently. Top each candy with a few flakes of Fleur de Sel, or other coarse sea salt. Allow the caramel and chocolate to cool and set before removing candies from the pan.